Downham Market's town centre is on a smaller scale than those of nearby Swaffham, Dereham and Fakenham, and here there is no great church lifting its head above the market place. 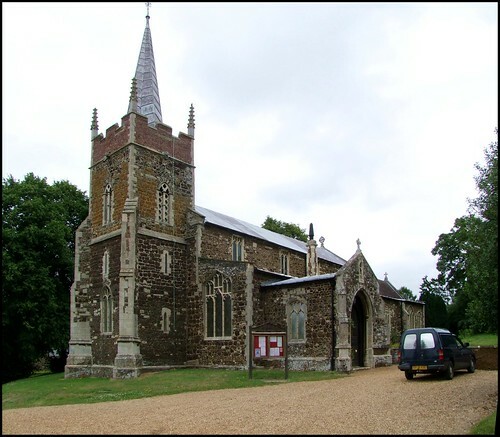 To find the parish church of this interesting town, you need to head out to the east, where it is hidden from view by trees on top of a rise above the road to Swaffham. Here St Edmund sits, a pretty thing in gingerbread carstone, with an elegant lead-covered spire crowning its squat tower. You can see at first glance that this is by no means a grand, urban church. I was struck by how few gravestones survive in the churchyard. Carstone is notoriously difficult to date, but the low aisles and nave are essentially 15th Century I think, while the chancel is a 19th century rebuild. Set into the stone above the priest door is a crucifixion scene, probably from the top of a former churchyard cross. It all makes for an interesting building quite unlike that of most Norfolk towns. Although there are exceptions, the parish churches of Norfolk's market towns tend to be High Church in character, even Anglo-catholic, and St Edmund is higher than most. The interior is rather dark thanks to a multiplicity of stained glass, but it was not gloomy, and the smell of incense and the view of the lighter chancel with its big six candlesticks on the altar was evocative and atmospheric. Essentially, this is a late 19th century interior, but there are a couple of important medieval survivals. The most significant of these is the set of 15th century glass panels set in the west window below the ringing chamber. They include figures from the orders of angels as well as angel musicians, a fragment of figures rising out of the mouth of hell from a Harrowing of Hell image, as well as another fragment of the dead rising from their graves. Set in front of the tower arch is a fine 15th Century font, the angels on the panels holding shields bearing symbols of Saints and of the Instruments of Passion. The low west gallery cuts off the top of the tower arch, but turning east it creates a sense of the church opening out, and a walk towards the chancel is from darkness into light. An enormous glass chandelier fills the nave, while the aisles spread into mysterious shadows beyond the arcades, which are quite different from each other, the south aisle being a curious mixture of arches, the north uniform. The east end of the south aisle opens out beside the chancel to form a Lady Chapel. Again, the furnishings of chancel and this chapel reflect the Anglo-catholic enthusiasm over the decades here, a reminder that, despite the Evangelical reputation of the Diocese of Ely, there are some pretty spectacular churches from the other wing of the Church of England to be found. There is some good late 19th and early 20th century glass, the best of which is in the south aisle. One excellent window near to the south doorway depicts King David accompanying musicians and a choir on his harp. The inscription tells us that it was placed here by the father and mother of George William Haylock, sometime Chorister and Organist of this Church. He died on November 9th 1918. This was just two days before the Armistice, and I wondered if his was a tragic death in those last few hours. But his name is not mentioned on the Downham Market war memorial. The kind tower captain insisted that we go up the tower and have a look at the view, but in high summer the trees were so full in leaf that it was difficult to see beyond the rather empty graveyard. It is possible to spot Ely Cathedral once the leaves have fallen.